Thanks to Kay Coggin for first sharing this story. Fenders Wave and Machine Quivers, While Coated Man and Vapory Wraith of Woman Occupy Seat. Geneva, Aug. 5. Whether the recent hot spell had an effect on the minds of the employees of the local garages is not known to be the cause of their state of mind, but certainly weird stories have been afloat during the past week, among which the following was told by the employees of the garages of the city, about a mysterious automobile, which has been given the name of “The Haunted Car.” The story is that the machine already has been in several garages, and, so far no employee has been found who will stay in the garage with the car over the second night. The machine is said to have come to Geneva from Rochester and the story connected with it is that it is one that figured in a murder case. A prominent young man is said to be serving a term of eighteen years for the murder of a young woman and this particular car is declared to be the one in which the fatal ride was taken. Peculiarities of the case are reported by several garage men, all of whom tell the same story. It is said that at exactly 2 o’clock in the morning the car begins to move. The car does not exactly leave its position on the garage floor, but the fenders wave, and the car quivers as though going at a high rate of speed. About the same time the figure of a man wearing a heavy overcoat appears and takes his seat in the car, followed by a white vapor like form. They remain but a second, and as they disappear the quivering of the machine also comes to a stop. One of the men who declares he saw the apparition, told the story of seeing the big man wearing the overcoat take his seat in the car on one of the warmest mornings last week. His companions told him he was suffering from the heat, and that night two of them remained in the garage. The following morning both men declined to discuss the case, but declared that they would not remain in the garage another night if the car remained in the building. The car was removed to a storehouse, it is said. Scotty Cummings, who claims to have driven the car from Rochester to the Geneva garage, declared that about 2 o’clock in the morning he thought that he noticed the form of a woman several times during the trip but declined to acknowledge it until after the story was told in the garage. “Declined to acknowledge” a spook in the car? 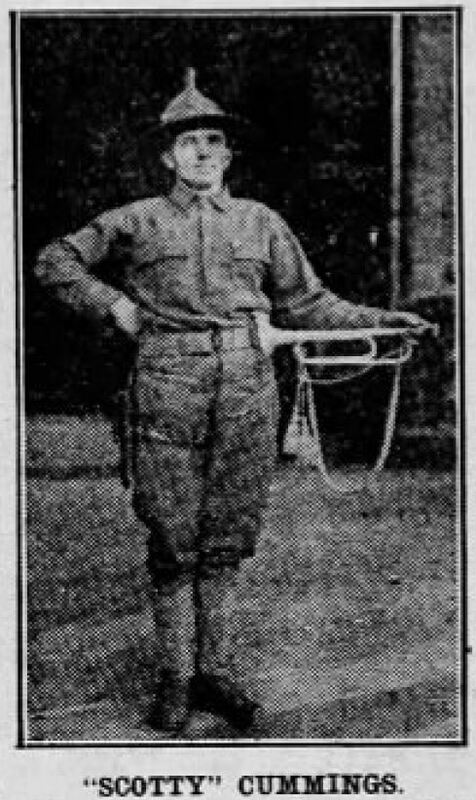 He’s got better nerves than I would have had under the circumstances, but, then, the chauffeur had seen combat as a bugler during the Spanish-American War. Ghostina the Haunted Car Scotty Cummings, the driver of the haunted car. The caption reads: “SCOTTY” CUMMINGS. Former buglar [sic] on border, chauffeur, who insists he rode with shadows, and was last to tell experience of creepy ride on trip to Geneva. The car quickly attracted crowds of the curious. Family of Driver Flee Shivery Place When Spooks Mount to Seat of Quaking Auto. SPECIAL DISPATCH TO THE DEMOCRAT AND CHRONICLE Geneva, Aug. 6. The building in North Main street, which is known as the Burgess Tabernacle, and now used as an annex by the Geneva Auto Company, is the mecca of the curious tonight and about fifty persons have signified their intention of visiting the place and staying until after 2 o’clock in order to witness the alleged supernatural actions of the haunted car. As a result of the strange maneuvers of the car during the past week, kept secret by the employees of the garage, one employee, Hans Hansen, a night man, is said to have quit because he was ordered to stay in the annex tonight and wash cars. Among those who witnessed the strange apparition were Jim Baird, who came here from Boston last week and engaged employment with the company, Martin Van Buran and Thomas Millard. All of these men are sure that they saw the vaporized form of a woman and a heavily coated man’s form enter the car at about 2 o’clock, but were loath to tell their experience until after one of the men declared positively that he had witnessed the strange forms while he was passing through the annex, on account of the strange noises and the quivering of the car which attracted his attention. He thought at first that some one was trying to gain entrance to the building, but when he passed the car and saw the quivering he decided in his own mind that the car was haunted, and made known the strange actions of the machine to the other employees of the garage. Scotty Cummings, who drove the strange roadster from Rochester to Geneva, was obliged to stay in the garage last night, and before he would decide to stay he took his wife and two daughters to the place to keep him company for the night. Cummings is positive that the car started to quiver and jump as if at full speed at exactly 2 o’clock last night, but kept the reason for his taking his family to the garage from them until after the apparition occurred. Then they were allowed to go home. It is said that the members of his family saw the strange antics of the car, and refused to stay in the building with Mr. Cummings, and he was obliged to take them home. The experience of those who are to stay in the garage to-night will be waited patiently for, and their opinions of the haunted car will be interesting to hear to-morrow. My mind went straight to the gutter, as the journalist apparently intended, with those comments about “the vaporized form of a woman and a heavily coated man’s form enter the car at about 2 o’clock” and “the strange noises and the quivering of the car.” This was beginning to remind me of the Bouncing Beds. While employees of the company were quitting in droves rather than working the night shift, it was that much more of an incentive for the curious, including the delightfully named undertaker, Mr. Yells, to sit up nights watching the car. Man and Woman Take Seats on Time. Geneva, Aug. 7. The Burgess Tabernacle is the center of attraction again to-night, the object being the antics of the haunted car which for the past week has been the cause of several employees of the company quitting their jobs for the reason that they were obliged to stay in the annex and work during the night hours. Last night, among those who stood vigil were Fred Yells, of the undertaking firm of Yells Brothers, William Vickery, Joseph McDuffle, Gorrie Allen. Humphrey Lynch and David Moore. All of these men were witnesses to the strange maneuvers of the automobile which began promptly at 2 o’clock. Mr. Yells stated that he stood close to the car at a few minutes before 2 o’clock, when his attention was attracted by a swishing sound, as if the machine was in a rapid motion, and soon afterward he, as well as the others who vouched for the apparition, saw the vaporized form of a man and woman enter the car and immediately the levers began to move and the throttle quivered and the whole car moved as if in rapid motion. Mr. Yells is positive, as is Mr. Vickery, that there is some influence governing the actions of the car and will watch again to-night with the others who have signified their desire to see the strange performance. Soon the haunted car got a pet name and fan mail from a lady who was eager to “trace out” the ghostly mystery. Rochester Woman Wants to Trace Mystery. Geneva, Aug. 13. William J. 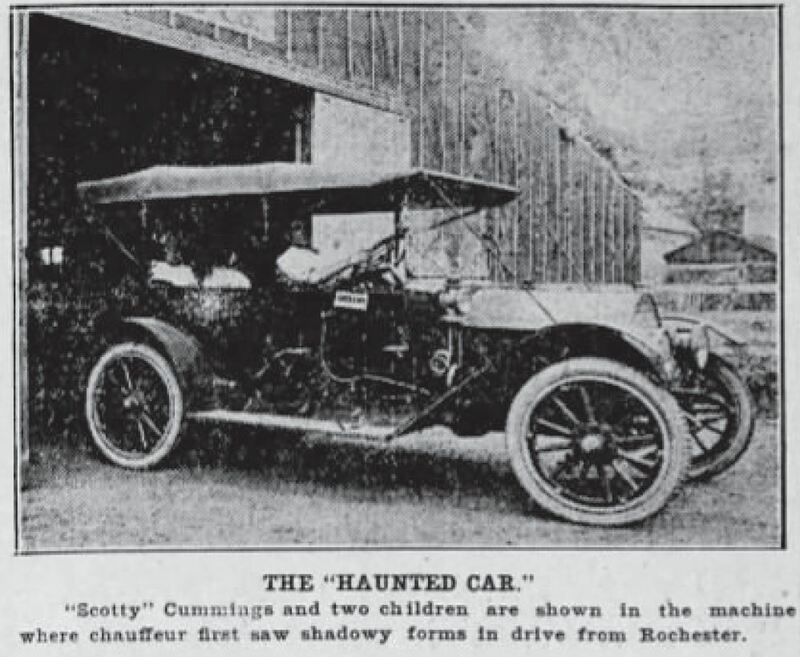 (Scotty) Cummings, is one of the best known chauffeurs in the city, and is the one who drove the “Haunted Car,” which has been christened “Ghostina” by the employees of the Tabernacle garage. Scotty is also well known by the soldiers of the United States, having served In the Spanish-American war, and was at the border with Company B during the Mexican trouble. Scotty in all has served nineteen years with Company B, and was recognized as one of the best buglers in the service. His blowing of “Taps” has gained him an enviable reputation throughout military circles. He was the first to witness the strange apparitions in “Ghostina,” but was the last to acknowledge what he saw until others came forward and made known the queer actions of the car. Mr. Cummings first observed the spectre objects while he drove the car from Rochester to Geneva. Geneva Auto Company is daily receiving communications asking questions about the strange machine, and if it would be possible to witness the manifestations if they visited Geneva. To all these requests the answer is that they would have to take their own chances, as there is no guarantee that the car will perform every night. Several nights during the past week the spirits failed to operate the car, although many persons were at the garage. “to Manager or whom this may concern. I do not know if the lady above was among the spiritualists who visited the haunted car. It was about this time that improbable explanations about fraud began to be voiced. Spook Specialists Claim to Have Got Line on Workings, and “Haunted Car” Is Moved for Try-Out. Geneva, Aug. 14. “Ghostina,” the “haunted car,” performed last night twice, the garage being visited by at least 400 persons. The antics of the car were not witnessed by all of these, as the crowd began to arrive at the Tabernacle as early as 8 o’clock. The most of those who came just viewed the car and stayed several minutes, and then departed. It was 4 o’clock this morning before the last of the crowd left the building, and then it was necessary to call Patrolman DeVaney to disperse the hangers-on. A letter was received by Herbert Cook, who witnessed the apparition last Saturday morning, from a Mrs. K. Vetchller, of R.F.D. 2, box 119, Rochester, who claims to be a spiritualist, and asked Mr. Cook’s permission to call at Geneva and drive the car to Batavia, where she will subject the car to the influence of a medium and is sure that great results will be accomplished. Mr Cook wishes to inform Mrs. Vetchller that it is not his car that is inhabited with the specter. The woman, in reading the articles of the haunted car, misunderstood Mr. Cook’s version of the apparition. Mr. Cook drove his own car to the Tabernacle from his home and then took a seat in another automobile next to ‘”Ghostina,” and witnessed the actions of the car. Among the other visitors who saw the car last night were Mr. and Mrs. Ambler, of Rochester, and Mr. and Mrs. H.R. Savage, of East Aurora. It is said that these four persons are spiritualists, and that they claim to have discovered the workings of the car. It is said that a young man by the name of Baker got into conversation with them, and told them that the car was worked by physical force, that there was a hole in the building behind the car through which a stick is used to push the car. To make sure about it, the officials of the Geneva Auto Company gave orders to have the car moved from the west side of the garage to the north side and orders were also issued to watch the car closely and see that no outsiders or any one else tampers with “Ghostina.” Officials of the company are as much interested to solve the mysteries of the car as any person, and will not forbid anyone with serious intention of visiting the garage to discover, if possible, the reason why the car should continue its supernatural antics, at certain intervals. It has been the custom of those who witness the actions of the car to keep their names secret. It was decided today that all persons who visit the garage hereafter will have to register their names and addresses before being admitted to the Tabernacle. It was said that Mr. and Mrs. Ambler, and Mr. and Mrs. H.R. Savage, of East Aurora, were very much exasperated when they were told that the car was worked by physical force. One woman was very determined to learn what influenced the car to move, and had a searchlight and got down on her back under the car to see if any wires or other agency was connected with the car to make it perform. Some of those who were there at the time said that while the woman was under the car it moved out on the floor of the garage at least four feet. What moved the car nobody knows and it is hoped that those who are skeptical about the actions of “Ghostina,” will come forward and solve the mystery to the satisfaction of the employees of the garage. If stick or pranksters were involved, there seem to have been a lot of witnesses about that did not see them, although, to be sure a group of spiritualists might have had something to prove. There does not seem to be a financial motive in this case; nobody was reported as charging admission, but as any good Fortean knows, money is not the only motivation for paranormal pranks. And what do we make of the initial reticence of driver Scotty Cummings? Was it a skeptic’s denial of what he had seen or a hoaxer’s hanging back to see if a trick was going to work? If a trickster, surely he could have steered the story more effectively than by scaring his own family. This final article is not specific about who the “eight Rochester men” were, but the story apparently hit a substantial bump in the road. Charge Made by Eight Rochester Investigators. “When we started to examine the car we were ordered away from it by a Geneva policeman, who was called by the manager of the garage. The garage was then closed, but was reopened again. “We went back and examined the car again. It is a big brown car with no starter. We found an electric wire running from the car to the ground. Then we started to pull the cushions from the seat and raised the hood, a big cop told us that we had done enough and to get out before he locked us up. That seems a bit ambiguous–what was the purpose of the wire running to the ground? And why was the wire not spotted by the woman with the searchlight on her back under the car from the August 15th article? Previously the manager of the garage had encouraged investigators; why call the police on this particular group? It is here that the story of “Ghostina” comes to a screeching halt. I can’t find anything after the police got involved, which would suggest that somebody decided to put the brakes on. Or perhaps the Great War, entered only a few months before, eclipsed such trivial mysteries.